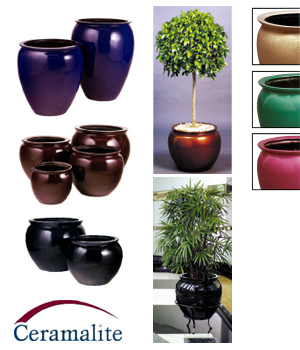 Choose from a wide variety of containers, including fibreglass, cottapot, ceramic and spun aluminium planters. Ceramalite containers are made from glass fibre reinforced polyester resin with additives. The standard colours are black, deep burgundy and midnight blue. However colour matching and other creative finishes are available on request at additional cost. The Ceramalite Wedge is made from glass fibre reinforced polyester resin with additives. The standard colours are black, deep burgundy and midnight blue However colour matching and other creative finishes are available on request at additional cost. Steel Smart is a comprehensive range of metal planters. The stainless steel range includes the following finishes: brushed stainless steel, bright, brass look and spun metal alloys in a variety of shapes and sizes. Karaka planters, pots, oil jars, vases and bowls are light weight, leak proof spun aluminium containers in modern metalic colours. Ceramic  The containers in this range have been fully waterproofed and can be situated both indoors or outdoors. There is a large variety of shapes, sizes and colours for your selection. Cottapot Containers are plastic planters that look like real terracotta. Available in colours including terracotta, sandstone, charcoal, heritage green and black.